"Department of Health - Public health, adult social care, and the NHS"
This appears to be a description of our state health system in all its forms - a national service that's designed to be free at the point of use for everyone, whether you're attended to in hospital, at home or in the community. With this in mind it's hardly surprising that, according to a recent survey, one in three of us believe that the state will pick up the bill should we need long-term care in our old age. However, contrary to widespread opinion, the social care system in England does not operate on the same principles as the NHS. Instead, it's up to each one of us to provide for our own needs - that is, unless we meet the stringent terms of a local authority means-test. When you factor in that the average cost of care for those aged over 65 is expected to be somewhere between £25,000 and £44,000 (for a man or woman respectively), the public misunderstanding of the social care system becomes an even greater cause for concern. When the state doesn't pay up, who does? Broadly speaking, under the current system anyone needing residential care with assets of more than £23,250 is required to fund the cost of their care until they can no longer afford to do so, even if this involves re-mortgaging their home. Once they drop below the means-test threshold, the local authority steps in. "A record number of pensioners are funding their own care home fees as councils push increasing costs on to the middle classes." The source of the Daily Mail's statistic is a 2012/13 market survey by Laing & Buisson, a provider of "healthcare market intelligence". 175,000 of them provided their fees in full and another 56,000 "topped-up" the local authority's base rate (meaning that they qualified for local authority assistance, but a third party - a relative, for instance - also contributed funds to their care). This means that in 2012 more than half of care home residents (57% of the total) met their own care home costs, at least in part. While the Laing & Buisson report is not publicly available, Full Fact has obtained a copy of the 2011/2012 version. The data in this report shows us that since 2003 self-funders have become a more important source of revenue for the care homes market - they were responsible for 34% of the market in 2003, but by 2011 they accounted for 41%. 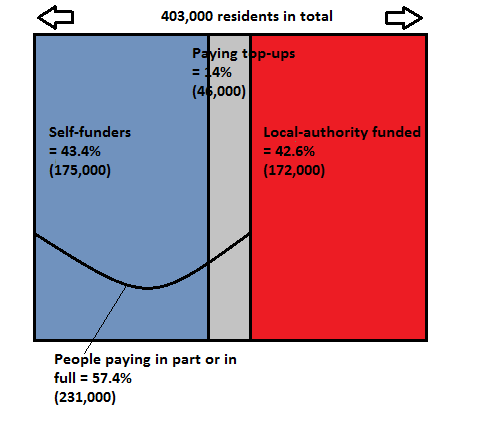 As the graph below illustrates, the number of self-funders has increased at the same time as there's been a corresponding decrease in the number of people subsidised by their local authority. Laing & Buisson's most recent report shows that private care homes are increasing their fees for private payers (or "the middle class", in the Daily Mail's parlance) in a bid to avoid bankruptcy. It's argued that this is a direct result of councils reducing the standard fee that they're willing to pay for care home placements. William Laing, the author of the market survey, noted that "councils continue to pay unrealistically low care home fees". As the Daily Mail suggests, a care home is able to 'cross-subsidise' its local authority residents by charging private payers extra. At the release of this 2012/12 survey, Mr Laing remarked that the gap between what local authorities will pay and what a care home will charge a private customer "is opening up to an alarming extent". Since the 2010 Spending Review, local authorities have been forced to make cuts to their budgets. In many areas of the country councils are the principal source of business for private care homes. This means that a local authority is - to an extent - in a position to dictate how much it's willing to pay for somebody's care. As a result, many councils have used their negotiating power to drive down or limit increases in the fees that they'll pay. Laing & Buisson calculated that in the financial year 2011/12 UK councils' baseline fees to care homes increased by an average of 0.3%. Meanwhile its researchers estimated that a care home would need to charge a fee rise of 2.8% in order to remain at 'standstill' in financial terms - in other words, to maintain profitability in line with inflation. Laing & Buisson observe that several of the large care home providers with "higher than average exposure" to publicly paid residents have seen reduced cash flow since austerity measures were announced. Meanwhile, Barchester Healthcare, whose clients are mainly private payers, has maintained its profit levels. Is this a stealth tax on the middle classes? The Daily Mail's outrage on behalf of "the middle class" is largely speculative. For a start, how are we to define the middle class? For residential care, most people who own property will fail to qualify for state assistance (as the value of a house or flat is likely to exceed £23,250, the upper limit of the means-test). In other words, the means-test threshold is very low - and any reform of the social care system is likely to involve it being raised. This means that when we talk about the middle class (those who would need to pay for their own care) we are dealing with a broad and diverse constituency - those surviving on the state pension who happen to have bought their council house, as well as those with £500,000 of assets. In fact a 1996 study by the PSSRU concluded that care homes are "predominantly a service for the less well off". It has been suggested that many of those who own property are more likely to request care in their home if their needs can be met in this way. As the Care Quality Commission has observed, between 2004 and 2010 the number of domiciliary care agencies increased by a third at the same time as there was a 10% fall in the number of residential care services. Why? Well, here's an interesting quirk of the system. If you apply for home care (which is cheaper for local authorities to provide), the value of your property is not included in a means-test. This means that more people qualify for means-tested home care. As a result, home care often makes more sense for a family's finances. So if the local authority won't pay, you're on your own? What the graph above doesn't quantify, and what is largely "off books", is the number of people who pay so-called third party top-ups - that is, those who are partially funded by the local authority but who also receive outside contributions to their care from a relative, friend or charity. There are no official statistics in this area. However, Laing & Buisson's survey results, based on responses from 1,700 care homes (some 10% of the total), indicate that between 2009 and 2011 28% of local authority funded residents were in receipt of top-ups. This number is double that displayed in the graph above (14%), which shows the extent to which we lack information on this practice. As the Office for Fair Trading put it, top-up payments should be "voluntary and to the older person's advantage" - for example, your family might contribute money for you to upgrade to an ensuite room. However, the OfT has shown that in certain cases local authorities have been requesting contributions for a basic package of care. While some people provide for their own costs and the local authority picks up the bill for others, there are individuals who fall into neither category. For a small but significant proportion the costs of their care home will be covered by the NHS (as our graph above illustrates). This is specifically the case when somebody needs intensive nursing care. According to Laing & Buisson, in 2012 29,000 care home residents (7% of the total) had their fees covered by the NHS Continuing Healthcare Programme. At the same time, there's increasing controversy about whether Primary Care Trusts are fulfilling all of their responsibilities in this regard - a subject to which Full Fact will be returning. In 2011 the Commission on Funding of Care and Support described the social care system in England as "not fit for purpose". It is certainly the case that it tends to penalise those who have accummulated savings. These are the people with enough assets that they do not qualify for means-tested assistance. Whether we describe this group as "the middle class" is - to an extent - a moot point. At the moment there is nothing that the majority can do to protect themselves from stratospheric care costs. While the Department of Health website might imply the opposite, our social care system has not been designed on the same principles as the NHS. Our health service is a collective insurance policy; but for those unlucky enough to need long-term care, there is no guarantee of protection.